There is a role for architecture to actively engage with the repair of the places it is part of: the soil, hydrology, habitat, connections, overland water flow, microorganisms, vegetation and so on. This type of repair is critical to enacting other wider types of social, economic and cultural repair. The Glebe Foreshore Walk was designed by JMD Design which describes it as ‘connecting existing and new foreshore open space by means of a subtly articulated path that connects the new spaces with several new water stairs, new mangrove habitat, terrestrial habitats, intertidal habitats, a new beach, bio swales and items of heritage and archaeological significance’. No doubt, readers are all familiar with the development of the Foreshore Walk. Since the project’s beginning, work undertaken has included new lighting and furniture, new fig trees and landscaping at Bicentennial Park and Bicentennial Park East; Bellevue House and Jubilee Park Grandstand were restored and the pavilion, sports field and children’s playground were upgraded. According to City of Sydney, the final part of the project involved opening the last stretch of land connecting 27 hectares of open space with streets, paths and new facilities. It included granite and sandstone paths, new seating, steps for safe access to the water, over 50 new native trees and shrubs and native grasses. The paths have walking, cycling and wheelchair access, racks for canoes and storage and energy-efficient lighting. One of the most appealing aspects of the Foreshore Walk is the ecological restoration that has taken place; including habitat for native plants, birds and marine life. 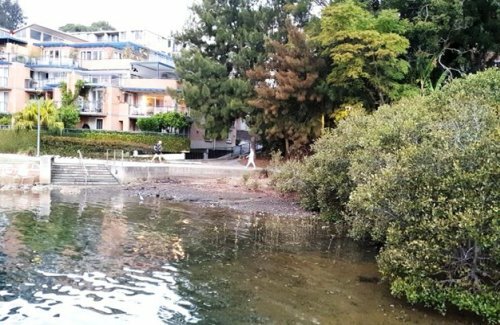 Anton James from JMD Designs said of the project that ‘the Glebe Foreshore is a fantastic project where we reconnected a fragmented ecology, and included archaeological elements, marine habitat, and created the only artificial mangrove in Sydney. We restored the saltmarsh which allowed intertidal habitats’. The Biennale takes place in Venice from 26 May to 25 November.